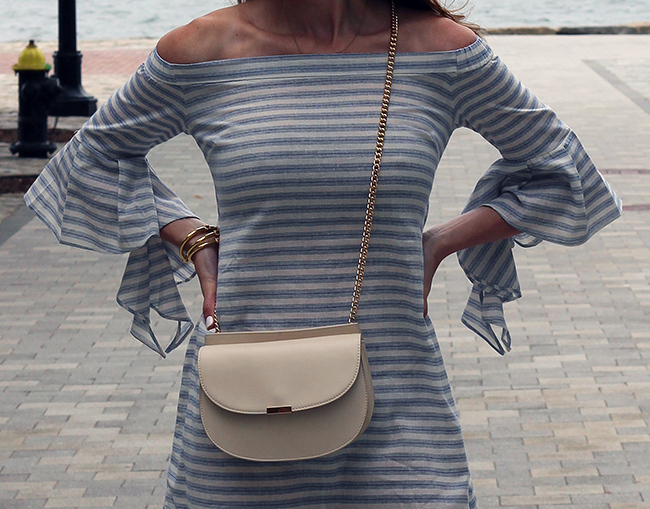 Is there anything better than an off-the-shoulder dress for the summer? Well, how about one that's not only off-the-shoulder, but has stripes, bell sleeves, and an open back? One would think that combination may be overwhelming, but no, this Chicwish Leisure Stripe Dress is just.... perfect. I'm loving the grey and white stripes, and the lightweight feel of this dress. The bell sleeves and peek-a-boo slit in the back add just the right amount of fun. Although this dress would pair well with lace-up sandals, I decided to wear my grey booties instead, and love the slight 70's vibe they add to the dress. I'm also thinking that a pair of little white sneakers would work great for a casual look, and transition this dress well into the fall. Thank you to Chicwish for partnering in this post, all thoughts and opinions are my own. I am in love with that dress. I love how you styled it with those cute booties, but I would definitely also try it with sneakers. Got to love versatile pieces! I love that gorgeous back detail on this dress, such a beautiful look! Gorgeous dress! I love that it is unassuming in the front but has such a nice cutout detail in the back. Flawless look babe! Such a beautiful dress! So you got all the trends! Very nice dress! I love the Bell sleeves, it is for sure that I am on the look out for a top with those sleeves. And I like the shoes you showed at shop the look! Loving this dress on you! Can I just say, you look amazing! This dress is absolutely FABULOUS!!! Love the stripes! Best dress EVER!! Your look stunning. Love your booties too! Wow those booties are fab! I love the gray stripes and monochrome look! So pretty! Love this dress - the back cutout is too cute! such a cute striped dress! love this look! :D pinned! Leg show! Love this dress on you, lady! The sleeves are too fun. What a cute sweater dress!